We’d love your help. Let us know what’s wrong with this preview of The Flower Girls by Alice Clark-Platts. To ask other readers questions about The Flower Girls, please sign up. Alice Clark-Platt's nightmarish and chilling psychological thriller brings back memories of the notoriously unforgettable 1993 murder of toddler Jamie Bulger by two boys. Here we have the character driven disturbingly unsettling story of 10 year old Laurel and her sister, 6 year old Primrose aka Rosie, who abduct, torture and kill 2 year old Kirstie Swann in 1997. The girls became tabloid and media fodder, becoming the infamous Flower Girls. Laurel is convicted and imprisoned, but Rosie is deeme Alice Clark-Platt's nightmarish and chilling psychological thriller brings back memories of the notoriously unforgettable 1993 murder of toddler Jamie Bulger by two boys. Here we have the character driven disturbingly unsettling story of 10 year old Laurel and her sister, 6 year old Primrose aka Rosie, who abduct, torture and kill 2 year old Kirstie Swann in 1997. The girls became tabloid and media fodder, becoming the infamous Flower Girls. Laurel is convicted and imprisoned, but Rosie is deemed too young to be held responsible, and given a new identity as Hazel. Now 19 years later, Hazel and her boyfriend, Jonny, who knows her real identity and his daughter, Evie are at a hotel in Devon. The weather is dire, with snowstorms when 5 year old girl, Georgie, goes missing. The past is about the haunt the present as a frantic search to find Georgie takes place to find her as quickly as possible and Hazel's life begins to spiral out of control. In the meantime, a bitter and resentful Laurel claims the death of Kirstie was an accident and is appealing the decision of the parole board. To all intents and purposes, her family appear to have abandoned her, and only her lawyer uncle has been in regular contact and supported her. Hazel's life is bought back into the spotlight as her real identity is revealed. The police are convinced that she is behind Georgie's disappearance given her shocking history, a case of history repeating itself. Max, an ex-journalist sees an opportunity for a exclusive story that he wants to turn into a book. Laurel's appeal faces implacable opposition from the lawyer aunt of Kirstie, Joanna Denton, intent on proclaiming the rights of the victim through a campaigning group 'Bang to Rights'. In a story that goes back and forth in time, we are given a clearer picture of the past, of what happened to Kirstie, and Laurel's trial. There are surprising twists as the Flower Girls once again come to connect, and we are given an unexpected ending. In 1997, two little girls (sisters) aged 10 & 6 abducted and killed a two year old toddler. The older girl was charged with the crime but younger one got a new identity. The younger sister (Rosie) went on to lead a normal life. 19 years later, another young girl does missing at the hotel where Rosie was staying. The Flower Girls are about to hit the headlines again! This is quite an uncomfortable book to read. It is indeed a twisted tale. The murder of the two year old girl read a lot like wh In 1997, two little girls (sisters) aged 10 & 6 abducted and killed a two year old toddler. The older girl was charged with the crime but younger one got a new identity. The younger sister (Rosie) went on to lead a normal life. 19 years later, another young girl does missing at the hotel where Rosie was staying. The Flower Girls are about to hit the headlines again! This is quite an uncomfortable book to read. It is indeed a twisted tale. The murder of the two year old girl read a lot like what happened to James Bulger. We are taken back regularly to 1997 where we learn of the sisters childhood before, during and after the murder. We also get glimpses of the older sisters trial. The book itself is sensitively written and utterly compelling. There are plenty of vivid characters. This story will definitely mix with your emotions that stay with you long after you've finished the book. 2 Sisters go out to play, while they are out they abduct and murder a baby! The Sisters are both horrible characters, again they are meant to be and if the author was hoping to create characters to despise then she succeeded! The other players in the book are equally unpleasant and there is an above average quota of stomach acid that they all seem to have! If the author wanted to create a book that got you at the end, again she succeeded!!! Laurel and Primrose (Rosie) Bowman became known as the "flower girls" after they abducted and killed a toddler in the 1990s. Laurel, aged 10 was tried as an adult and found guilty of murder but Rosie, only 6 years old was considered too young to charge and was instead given a new identity as Hazel Archer. She and her parents move away and have no further contact with Laurel. Twenty years later Laurel has been trying to get parole but is being blocked by the dead toddler's family who feel she sho Laurel and Primrose (Rosie) Bowman became known as the "flower girls" after they abducted and killed a toddler in the 1990s. Laurel, aged 10 was tried as an adult and found guilty of murder but Rosie, only 6 years old was considered too young to charge and was instead given a new identity as Hazel Archer. She and her parents move away and have no further contact with Laurel. Twenty years later Laurel has been trying to get parole but is being blocked by the dead toddler's family who feel she should never be released. Now grown up, Hazel and her boyfriend Jonny are staying in a hotel when five year old Georgie goes missing and when Hazel's true identity becomes known she immediately becomes a suspect. Amid the media frenzy, Max, a writer and journalist staying at the hotel offers to write her side of the Flower Girl story to help clear her name. Although this made for an uncomfortable read at times, I thought this novel raised lots of issues and some interesting questions that would make good discussion for a book group. Can a very young child be evil? How old should they be before they should be responsible for their actions? How long should a child be incarcerated for killing? And would a young child who killed another child be likely to re-offend as an adult? There is also the role that the media and public outrage play in cases like this. This was an intense and very disturbing read and I'm still processing how I feel about it. In 1997, two little sisters aged 10 and 6 abducted and killed a two year old toddler. The older sister has been charged with the crime but the younger one, Rosie, was given a new identity and lived a happy life until another little girl goes missing at a hotel where Rosie is staying. Reading about the abduction of a young child will probably make everyone feel quite uncomfortable. That's how I felt throughou This was an intense and very disturbing read and I'm still processing how I feel about it. Reading about the abduction of a young child will probably make everyone feel quite uncomfortable. That's how I felt throughout reading the Flower Girls. However, despite the dark nature of the synopsis, the book gripped me and it was hard to put down. 19 years after the crime, there are still many open questions about the case. The answers are provided to us progressively by switching between chapters set in the present and in 1997. What I am still struggling to get over, is the ending of the book. It definitely does not sit well with me and it left me feeling uneasy but I suppose that's what the author's intention was. I read The Flower Girls in one sitting- utterly compelling and a real page turner. It’s not a new story – children committing horrific crime then years later the consequences of their actions still resonate- but Alice Clark-Platts tells it so well, with an underlying and unsettling sense of emotion that gets under your skin. This is a purely character driven drama, two sisters, one in prison, one who was too young to be brought to account and assumed to have been lead by her evil sibling. 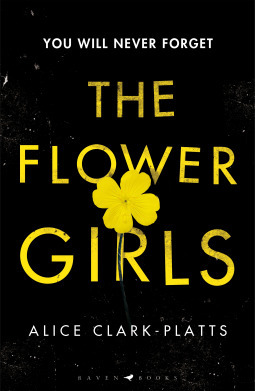 Now anot I read The Flower Girls in one sitting- utterly compelling and a real page turner. This is a purely character driven drama, two sisters, one in prison, one who was too young to be brought to account and assumed to have been lead by her evil sibling. Now another child has gone missing and the truth will out – or will it? This is a twisted tale indeed with sinister undertones and a genuinely realistic feel. Child killers are both horrific and fascinating if we are honest with ourselves and the author plays on that as the drama unfolds, cleverly messing with perception and ultimately leaving the reader with a distinctly uneasy feeling. Overall this was a terrific, addictive read, beautifully atmospheric and intelligently woven. So this was such a chillingly interesting premise and almost from the onset here because of the delicate and disturbing subject matter we are being exposed to I felt an almost deep sense of unease and dread down to my very bones. This really wasn't an easy subject to take on board and digest: but it was one I really wanted to tackle just because of the discomforting content and unpleasant questions this poses when dealing with the actions of children and their culpability when committing such horrific crimes and while there were instances I found The Flower Girls to be thought Provoking and intense I also thought it started with a bang then slowly fizzled away leaving me feeling rather deflated inside as I was really expecting so much more then what I was actually given. So this is told in then and now time and from multiple POV's: it also jumped around slightly which could be a tad disconcerting at times. I loved the way this was almost a puzzle: a mystery to be solved and it did make me question what to actually take at face value here and how authentic was the limited information we were being dripfed by the author. I was also left with questions here: one being the conspiracy of silence for so many years between the girls themselves. I really liked where this eventually took us in regards to that end reveal: but did feel that this should have been expanded on and some clarity offered regarding the Why? This did to me feel unfinished with that rather abrupt ending and I felt like I was leaving the story before the eventual conclusion was offered up. I did enjoy this mostly but on reflection, there were just some aspects here that didn't quite work for me. I would still recommend this as its very well written and in my opinion, did have more positives than negatives. I voluntary reviewed an Arc of The Flower Girls. I loved this book, so different from other books that I have been reading recently. I read this over 10 days with Pigeonhole Books and at times I just wanted to keep reading to know what was going to happen next. The story of 2 sisters Laurel and Rosie. Laurel is convicted of the murder of 2 year old Kristie and sent to jail. Rosie is too young and is given a new identity and a new life. 19 years later her real identity is revealed . Oh,Wow,just Wow. There isn't enough superlatives in the English language to describe how much I loved this book.It's the mesmerising,thought-provoking,chilling story of two sisters Laurel (10) and Primrose (Rosie) (6) who tortured and murdered two year old Kirstie Swann on a warm summer's day in 1997. Dubbed The Flower Girls by the press,Laurel was convicted whilst Rosie who due to her young age couldn't be held accountable was given a new identity and a new life. On New Years Eve,nineteen years Oh,Wow,just Wow. There isn't enough superlatives in the English language to describe how much I loved this book.It's the mesmerising,thought-provoking,chilling story of two sisters Laurel (10) and Primrose (Rosie) (6) who tortured and murdered two year old Kirstie Swann on a warm summer's day in 1997. Dubbed The Flower Girls by the press,Laurel was convicted whilst Rosie who due to her young age couldn't be held accountable was given a new identity and a new life. I was so engrossed with this book that I devoured it in one sitting. This was chilling as this could have been a true story. Unfortunately children murdering another child has happened in real life!! When the flower girls Rosie and Laurel were aged 6 and 10, they were playing in the park and take a toddler called Kirstie down to the canal, where they commit a heinous crime. One sister goes to prison whilst the other one is given a new identity. Hazel is staying at a seaside hotel with her partner I was so engrossed with this book that I devoured it in one sitting. This was chilling as this could have been a true story. Unfortunately children murdering another child has happened in real life!! One sister goes to prison whilst the other one is given a new identity. Hazel is staying at a seaside hotel with her partner Jonny and his teenage daughter Evie when a child goes missing, straight away Hazel is the chief suspect but she has always denied hurting Kirstie. Will she ever be free from her past? This is a twisted story. I have never really thought about the criminal’s family and how they would be affected and judged by the public and the press. Worse of course as they were children when they committed the crime, where did this evilness come from, nature or nurture? A fascinating book that’s chilling but very thought provoking, the ending has stayed with me long after finishing this story. Thank you NetGal It's true. You'll never forget THE FLOWER GIRLS. 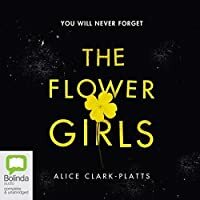 The Flower Girls, Alice Clark-Platts debut thriller is both emotional and chilling due to the thought-provoking and complex plot. It reminded me right away of the James Bulger case, and as if the horror of finding a murdered child isn't enough the brutal, merciless killers are children themselves. 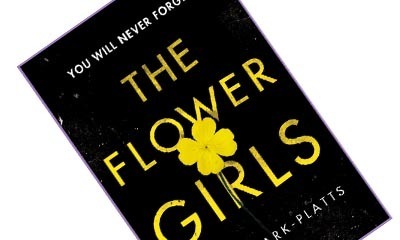 Just like the Bulger case, this story brings a lot of emotion to the surface as we struggle to decipher why these children would carry out such an incident and how much culpability do they have for the The Flower Girls, Alice Clark-Platts debut thriller is both emotional and chilling due to the thought-provoking and complex plot. It reminded me right away of the James Bulger case, and as if the horror of finding a murdered child isn't enough the brutal, merciless killers are children themselves. Just like the Bulger case, this story brings a lot of emotion to the surface as we struggle to decipher why these children would carry out such an incident and how much culpability do they have for their actions at certain ages? It's quite didactic which I liked; it dealt with morality in a subtle way rather than shoving preconceived ideas down your throat. Having studied law at degree level the questions surrounding intent, age, brain capacity and responsibility of children for their actions were endlessly compelling to me. By the end of the book I had so many questions, and I love it when a novel is both rivetingly good and inspires a multitude of questions to arise in a readers mind. This is the story of Laurel and Primrose, who when they were aged 10 and 6 respectively, committed a terrible crime. Because Rosie was so young, only Laurel was charged, and has been in prison ever since. Rosie and their parents were given new identities and new lives and none of them have seen Laurel since. This sounded like it was going to be a book that I would love, and I did like it, but ultimately I was a little disappointed. The writing was fine, the story was fine, but I just feel that som This is the story of Laurel and Primrose, who when they were aged 10 and 6 respectively, committed a terrible crime. Because Rosie was so young, only Laurel was charged, and has been in prison ever since. Rosie and their parents were given new identities and new lives and none of them have seen Laurel since. The writing was fine, the story was fine, but I just feel that something was lacking, and I am not sure what it was. I have to admit, part of the ending I did see coming, but part I did not, but I was not particularly shocked by the part I did not guess. Nevertheless, important issues of punishment, reparation and justice are treated sensitively especially via the character of Joanna, a legal lobbyist drowning in her own obsessive work fuelled by an understandable but ultimately counter-productive hate. It's a shame that the pressures of the psycho-thriller genre force important issues to be constrained and held back for shock value (that constant authorial need for the ubiquitous twist) rather than being explored in more psychological detail. This is certainly at the more emotionally weighty end of the crime spectrum but I'd love to see Clark-Platts break with the somewhat hokey genre tricks and free herself from the constraints to which she subjects herself. I hate to say this but the book has really disappointed me. It took me a while to get into it as I felt the beginning a bit messy but once I got into it I liked it. What was the ending all about? I feel let down with such an abrupt ending. It feels unfinished somehow. This is the story of the Flower Girls. Two sisters, who back in 1997, were involved in a truly horrific crime - the torture and murder of a two year old girl. What makes this even more despicable, if possible, is the ages of the sisters. Laurel was ten when the crime was committed and Rosie was just six yeas old. Laurel was sent to a children's 'prison' until she reached eighteen, then she was transferred to an adult prison, where ten years later, she remains. Rosie was considered too young to be This is the story of the Flower Girls. Two sisters, who back in 1997, were involved in a truly horrific crime - the torture and murder of a two year old girl. What makes this even more despicable, if possible, is the ages of the sisters. Laurel was ten when the crime was committed and Rosie was just six yeas old. Laurel was sent to a children's 'prison' until she reached eighteen, then she was transferred to an adult prison, where ten years later, she remains. Rosie was considered too young to be held responsible in the death of two year old Kirstie, so was given a new identity and moved away from Laurel, with her mother and father. Rosie now goes by the name Hazel, and whilst on a holiday in Devon with her boyfriend, another young girl goes missing at the hotel she is staying in. Will the police find out Hazel is Rosie? Will they blame her for the disappearance of another toddler? Did Hazel have something to do with it? Will they find the missing girl? This story is told from the perspective of a multitude of characters: Hazel, Laurel, Hillier - the police detective on the new disappearance case, Max - a journalist/writer also staying at the hotel, and Joanna - Kirstie's aunt who has been campaigning against Laurel's release from prison, since she came up for parole the first time, ten years ago. I enjoyed hearing everyone's view point, and felt this gave the story more weight. We heard the different sides to each bit of the story and there were different emotions being shown, depending on who we were hearing from at the time. Each character was so very well written, that I could distinguish between them easily. Hazel is a complex character, one which we feel sorry for, and also wary of at the same time. Do we empathise with her plight of being the sister of the notorious Laurel Bowman, the child murderer? Or do we treat her with caution, that she was involved in the torture of a child. Hazel has always protested her innocence. Even now, she can't remember all the details of that fateful day. This story fills you with tension. It discusses the debate between being born evil or learning it. Are children evil? It explores the age of criminal responsibility. And while it doesn't go into gory details about the 1997 crime, it lets you fill in the blanks for yourself, which in a way is worse. You conjure up images of past stories like it. Of other past crimes involving children, especially little Jamie Bulger. I would recommend this to crime fans. It is fast paced, switching back and forth between 1997 and now. As the book progresses we learn little bits here and there about what happened that day, and who each of the characters really are. When the new disappearance case closes so early on in the book, I was a bit taken aback as to where the book was now going. But the story was so well crafted that I didn't have to wait long to see. This is a harrowing and thought provoking novel, presumably inspired by the notorious murder of two year old James Bulger by two young boys, in 1993. That was the year I finished uni and started work, so I was studying and then working all hours, and barely watched any TV, but even in those days before instant and 24 hour news, I remember the saturation coverage and the tabloids’ fascination with the killers, which continues to this day, so while the premise seems at first unbelievable, on refle This is a harrowing and thought provoking novel, presumably inspired by the notorious murder of two year old James Bulger by two young boys, in 1993. That was the year I finished uni and started work, so I was studying and then working all hours, and barely watched any TV, but even in those days before instant and 24 hour news, I remember the saturation coverage and the tabloids’ fascination with the killers, which continues to this day, so while the premise seems at first unbelievable, on reflection it is plausible and therefore all the more horrifying. In 1997 on a summers day in a small English town, two young sisters abduct a toddler from a playground while her heavily pregnant mother chats with friends. The girl’s body is found, horrifically beaten and tortured, and 10 year old Laurel, and 6 year old Rosie, dubbed the Flower Girls by the media, are soon arrested for the crime, but only Laurel is convicted as Rosie is deemed too young to understand the consequences of her actions. Twenty years later, Rosie, now known as Hazel, visits a seaside hotel with her boyfriend to celebrate her birthday and New Years Eve. When a 5 year old disappears, Hazel is terrified that her secret will be revealed and that she will be blamed for the crime, but a predatory ex-journalist, who scents a major story, persuades her to confess to the police, and all her fears come to pass. Meanwhile Laurel is half-heartedly making another attempt at parole, but having never admitted her guilt or expressed remorse, the victims family, and many of the public, are adamantly opposed to this. The writing was stunning, with lyrical turns of phrase and an amazing sense of place. Unfortunately it was spoiled for me by the bizarre misuse of capitals in the ARC I received, many being missing, especially at the start of sentences, meaning you often had to read them twice, but also turning acronyms into weird looking words, and then capitals turning up in the middle of other words. I had assumed this was accidental and a gremlin in the typeface software, which would be fixed before publication, but then at the end, specific mention was made of the font, making me question whether in fact this is deliberate. If this is something that would bother you, I suggest taking a peek inside before you buy, but no other reviewer has mentioned it so maybe it’s just mine? The other reason for downgrading this to 3 stars is the ending, which other reviewers have complained about. The solution to the mystery is well sign-posted as the plot progresses, and flashbacks reveal progressively more about the girls’ past, but then a bizarre double twist is thrown in that makes little sense and leaves a slightly bad taste. It’s not that I necessarily need a happy ending, but I like a definite resolution and for some sense of right prevailing. 3.5 rounded down. If you like delicious meals made from off-the-shelf ingredients, you should enjoy Alice Clark-Platts’ The Flower Girls. What happens after underage murderers are released has been the basis of numerous thrillers: my favourites of all are Alex Marwood’s The Wicked Girls and Elizabeth Little’s Dear Daughter. Here two decades ago two sisters, Laurel and Primrose (hence the title), aged 10 and 6, were charged with the torture killing of the little 2-year-old Kirstie. Laurel was tried and convicted, If you like delicious meals made from off-the-shelf ingredients, you should enjoy Alice Clark-Platts’ The Flower Girls. What happens after underage murderers are released has been the basis of numerous thrillers: my favourites of all are Alex Marwood’s The Wicked Girls and Elizabeth Little’s Dear Daughter. Here two decades ago two sisters, Laurel and Primrose (hence the title), aged 10 and 6, were charged with the torture killing of the little 2-year-old Kirstie. Laurel was tried and convicted, and at age 18 moved to an adult women’s prison, where she is still incarcerated. Primrose was too young to be held legally responsible. (That too was the basis of Andrew Taylor’s absolutely brilliant The Office of the Dead.) Primrose now has a new identity as Hazel, but whilst staying at a seaside hotel in Dorset with her fiancé and his daughter Evie, a little girl goes missing. Of course, we are not surprised at who becomes the number one suspect when Hazel’s real identity is found out by the police and the press. Artistically it is not a perfect book. The present story of the missing child and the backstory run awkwardly and the twist that combines them will at least be speculatively foreseen by the experienced mystery story buff though hidden by a couple of really smelly red herrings. (Another Madeleine McCann knock-off, but an important clue will spring off the page in the reader’s face.) But the vividness of the principal characters will make this story impossible to put down. As Alice Clark-Platts is herself a human-rights lawyer, questions of justice, responsibility, and forgiveness arise, without any easy or obvious answers. (Personally, I think life without possibility of parole is worse than a death sentence, but given a criminal justice system where virtually all prosecutions are malicious, capital punishment is unconscionable as well. Yet the murder of a child is scarcely material for restorative justice.) Like The Wicked Girls, The Flower Girls features an example (two really) of generous self-sacrifice, but here the final twist indicates the beneficiaries scarcely deserved it. So I award four stars for literary quality, but five for moral and spiritual value. For those of us fascinated by conflicts between moral and legal responsibility, this is a splendid read. In 1997 sisters Lauren 10 and Primrose 6 abducted and killed a 2-year-old Kirsten Swann. Only Lauren was arrested for her murder, as they thought Primrose was too young to be convicted. Present day Lauren is still in prison for the crime, and Primrose has a new identity and a new life. Her name is now Hazel. Nineteen years later, Hazel (Primrose) is celebrating the New year in a hotel off the Devon coast, with her boyfriend Johnny. When 5-year-old Georgie goes missing. When the police arrive, the In 1997 sisters Lauren 10 and Primrose 6 abducted and killed a 2-year-old Kirsten Swann. Only Lauren was arrested for her murder, as they thought Primrose was too young to be convicted. Present day Lauren is still in prison for the crime, and Primrose has a new identity and a new life. Her name is now Hazel. Nineteen years later, Hazel (Primrose) is celebrating the New year in a hotel off the Devon coast, with her boyfriend Johnny. When 5-year-old Georgie goes missing. When the police arrive, they discover that Hazel is one of the guests at the hotel and Hazel becomes number one suspect for the disappearance of the girl. The Police think that history has repeated itself and ‘The Flower girls’ have returned. The press finds out about Hazel and the flower girls campaign returns. At the same time Lauren is yet again has her parole hearing. Hoping this time that she will be released. If you are a fan like me of Psychological thrillers this is the book for you. This is intriguing and thought provoking thriller, that you will keep thinking about well after you finishing the book. This gripped me and kept me reading into the early hours of the morning, I liked it so much. This book will be one to watch. I will be looking out for more books from this author. Following two police procedurals Alice Clark-Platts’ third novel tackles the ever fascinating topic of children that kill and explores some of the most contentious issues surrounding crime and justice. From the familiar nurture/nature debate on the origin of evil to prison tariffs, deciding when a criminal has paid their dues right through to the influence of the media, the novel is full of food for thought. Despite feeling heavily dramatised from the off the story gets off to a promising start Following two police procedurals Alice Clark-Platts’ third novel tackles the ever fascinating topic of children that kill and explores some of the most contentious issues surrounding crime and justice. From the familiar nurture/nature debate on the origin of evil to prison tariffs, deciding when a criminal has paid their dues right through to the influence of the media, the novel is full of food for thought. Despite feeling heavily dramatised from the off the story gets off to a promising start and sets up an engrossing premise when the new identity of one of the notorious Flower Girls children (Laurel and Primrose Bowman) involved in the killing of two-year-old toddler, Kirstie Swann, in 1997 is compromised. Whilst ten-year-old Laurel was convicted and imprisoned for abducting, torturing and killing the child, her younger sister, Primrose (Rosie), was six and therefore deemed below the age of criminal responsibility. With Laurel never having admitted her guilt or opened up about her actions and a traumatised Rosie having erased all memory, little is known about that fateful day. Fast-forward nineteen years and Laurel is still languishing in prison with only her uncle for familial support and Rosie is living under a new identity (Hazel Archer) and working as a legal secretary with marriage on the cards. As Hazel celebrates turning twenty-five on New Year’s Eve with partner Jonny and his fourteen-year-old, Evie, at a hotel in deepest Devon, the disappearance of another child (five-year-old Georgie Greenstreet) comprises her new identity and sends the Flower Girls straight back to the front page headlines. As a feisty DC Lorna Hillier attempts to root out the truth behind the child’s disappearance in adverse weather condition with her edgy parents acting shiftily, a former journalist and author, Max Saunders, spots a money making opportunity to tell Hazel’s story and potentially sway hostile public opinion. And with Hazel having received a series of ominous threats in the form of letters and dead flowers prior to the holiday the events of the past are about to wreak havoc on her carefully constructed world. With Hazel’s real identity now public knowledge it also coincides with a bitter and aggrieved Laurel due to come before the parole board for the latest in a series of unsuccessful appeals for release driven by her lawyer uncle, Toby, and sets up a chance for the two sisters to come head fo head. But Laurel is facing vocal opposition to any release from Joanna Denton, the aunt of Kirstie Swann, and her company ‘Bang To Rights’ whose tireless campaigning has been instrumental in influencing public opinion. Divided into three roughly equal sections, part I ends with the Devon disappearance of Georgie and part II concentrates on the prospect of reuniting Hazel with Laurel. As part III delivers a verdict to Laurel’s hope of release and looks at the sisterly bond, it also addresses the lasting impact of such heinous acts on the victims. Flashbacks to 1997 throughout the story shed light on actual events and highlight several intriguing issues about the childhood of the sisters that goes some way to explaining the drivers behind the horrific event. Clark-Platts’ clearly has the intelligence for a probing analysis and although her novel makes some insightful points it tackles very few head on, and this is a disappointment as the author’s prose is persuasive and sensitive. Perhaps the scope of the novel was over ambitious for the length of 320 pages but after a compelling part I I did feel that it tapered off and the story ultimately played to the psychological thriller crowd. Tension noticeably abated midway through the story and an abrupt denouement felt like a missed opportunity for a deeper analysis. The pity is most readers familiar with the psychological thriller genre will spot the twist coming from a mile off and Clark-Platts’ would have been well served by a maturer analysis. Whilst various perspectives contribute to the narrative the story is heavily character-driven and sadly I was not entirely convinced by the characterisation with most feeling superficial and others (such as Evie) entirely superfluous. Nevertheless Clark-Platt’s writes well and this is an engaging but ultimately lightweight read with the rationale of neither sister entirely transparent. Twenty Years ago, Laurel and Primrose, only children themselves, kidnap and torture a young child in the woods. The media has labeled them as The Flower Girls, but only Laurel is sent to jail as Primrose is only six years old and can’t be held legally responsible. Fast Forward almost twenty years and Primrose now goes by the name Hazel Archer. Hazel, along with her boyfriend Jonny and his teenage daughter Evie, are away celebrating New Years Eve when a small child goes missing at the hotel they Twenty Years ago, Laurel and Primrose, only children themselves, kidnap and torture a young child in the woods. The media has labeled them as The Flower Girls, but only Laurel is sent to jail as Primrose is only six years old and can’t be held legally responsible. Fast Forward almost twenty years and Primrose now goes by the name Hazel Archer. Hazel, along with her boyfriend Jonny and his teenage daughter Evie, are away celebrating New Years Eve when a small child goes missing at the hotel they are staying at. Hazel’s past becomes exposed and she finds herself back in the media spotlight. Hazel has always professed her innocence, but another missing child is too much of a coincidence. Is Hazel as innocent as she appears to be? I love a good thriller I can really sink my teeth into. One that will keep me guessing through the many twists and turns. The Flower Girls by Alice Clark-Platts is so much that and more. I found myself engrossed in this heartbreaking story. No one ever wants to think of children as killers, but it does happen and there have been many cases of children who kill. The Flower Girls really hits home on nature versus nurture especially when it comes to Laurel and Primrose. Who is to blame? The parents? Are some kids just born evil? Even today we still don’t know the answers to these questions. Hazel just wants to live a normal life, have a normal relationship, and be out of the public eye. She does not remember what happened that day almost twenty years ago and since then has had no contact with her sister, Laurel, who is presently housed in a prison cell. But, when a new child goes missing and Hazel is thrust back into the spotlight it brings her face to face with her past especially when journalist Max Saunders wants to sensationalize her story. Hazel is so interesting to me and Alice Clark-Platts really created a well fleshed out character wherein parts made me want to believe her story and yet not believe her as well. I kept going back and forth hoping there was more to her story. Laurel, now institutionalized for almost twenty years has become hardened. Her family wrote her off and disappeared under a new name. She has no one but her uncle Toby who is also her solicitor. Toby is tirelessly working hard on Laurel’s parole hearing, but Joanna Denton, aunt to the little girl killed long ago is a huge obstacle and will not accept Laurel ever getting parole. Joanna believes Laurel can never be rehabilitated and should live the rest of her life in prison where she belongs. The Flower girls really takes an indepth look at families who have lost a loved one to a crime and how they would feel about the perpetrator. I think this part of the story was really done so well. Like Joanna, I think it would be very hard for me to let it go. I would want the maximum under the law and quite frankly, I would hope they would never get released. Alice Clark-Platts really took a gamble with the ending of this story and I have to say it was quite a mindf*ck for me. No matter how many scenarios and twists within this story, I have to say I was very very shocked. I kept going back and forth with the shocking ending and the longer I thought about it I realized the ending couldn’t have been any more perfect. The Flower Girls is a dark, disturbing and really rather haunting story. Nearly twenty years ago, the brutal murder of two-year-old Kirstie Swann shocked the nation, not least because the apparent perpetrators, Laurel and Rosie Bowman, were just ten and six years old. Laurel, above the age of criminal responsibility, is tried and convicted of murder, and has remained in custody ever since; her sister, too young to stand trial, moves away with her parents and a new identity. Still, the public haven’t forgotten the girls dubbed by the press “the Flower Girls” - like other young killers, their names and photographs have become a byword for evil. But nobody knows what really happened that day... because neither Laurel nor Rosie has ever told. Many years later, Rosie - now known as Hazel, and having successfully rebuilt her life - is staying at a Devon hotel with her boyfriend when another young girl, five-year-old Georgie Greenstreet, goes missing. It looks like the past is coming back to haunt her. The story is told from a number of angles - we see Laurel and Rosie/Hazel both then and now, but we also see their story through the eyes of others. Joanna, the aunt of murdered Kirstie, has diverted her grief into anger, devoting her life to ensuring that her conception of justice is done - for Joanna, that means Laurel’s never getting out of prison, not if she’s got anything to do with it. Meanwhile, tenacious Detective Constable Lorna Hillier is determined to uncover the truth about what’s happened to Georgie before it’s too late. Despite the unpleasant subject matter the story is compellingly and sensitively written, forcing the reader to examine notions of guilt, responsibility and retribution, particularly through the character of Joanna. The crying out for vengeance-at-all-costs of a certain section of the general public is laid bare here during a radio phone-in involving Joanna when one caller remarks that Laurel “should’ve been hanged from the start”. “You’d have hanged a ten-year-old?” enquires the host, causing the caller to quickly backtrack... though only slightly. There’s a strangely fairytale quality at times about The Flower Girls - but most definitely the darker kind. There’s nothing cosy or comforting here. And the ending is truly unexpected and horrifying. This went from yeh its okay to one of the most enjoyable crime thrillers I have read in a long while. Based upon two girls, 6 and 10, accused of violently killing a toddler in 1997. The 10-year-old is convicted but the 6-year-old is deemed too young under the law. Now 19 years later with a new identity, the now 25-year-old is staying at a hotel where a young child goes missing. The past is slowly revealed but will the policewoman, writer or uncle work it all out before it's too late. Recommended This went from yeh its okay to one of the most enjoyable crime thrillers I have read in a long while. The Flower Girls just didn’t work for me. Having read several other books with a similar theme, I was excited to read this book as the description and blurb was intriguing and interesting. Unfortunately after the prologue which was, imo, enticing and uncomfortable the book then left me cold. I was unable to connect with any of the characters, which meant I stopped caring about who, why, when and how. At just over halfway through my kindle told me I had 1 hour 30 left in the book, so I continued on The Flower Girls just didn’t work for me. Having read several other books with a similar theme, I was excited to read this book as the description and blurb was intriguing and interesting. At just over halfway through my kindle told me I had 1 hour 30 left in the book, so I continued on hoping that something would change and I would feel differently. Unfortunately it didn’t and I finished the book feeling disappointed as I really was hoping this book would WOW me. I really enjoyed this book. It is cleverly written, allowing the reader to jump from one character's mind to another, in a way that you rarely find in books, particularly in this genre, these days. For once, I didn't spend my time listening to the audiobook (which was brilliantly performed by Emilia Fox) trying to work out who was responsible for what, but instead just enjoyed the ride. A fascinating topic and rich back story to the Flower Girls, with a host of excellent characters. The opening chapters in this book are enough to make any mother break out in a cold sweat. The first chapter way back in 1997 is when two sisters Laurel 10 and Primrose/Rosie 6 entice a toddler from the park down an old canal path where the little girl would be found brutally murdered later in the day. In court the sisters were dubbed The Flower Girls. Laurel stood trial for murder while her sister and mum and dad were given new identities and moved far away. Rosie was deemed to be too young to The opening chapters in this book are enough to make any mother break out in a cold sweat. The first chapter way back in 1997 is when two sisters Laurel 10 and Primrose/Rosie 6 entice a toddler from the park down an old canal path where the little girl would be found brutally murdered later in the day. In court the sisters were dubbed The Flower Girls. Laurel stood trial for murder while her sister and mum and dad were given new identities and moved far away. Rosie was deemed to be too young to stand trial for murder. Nineteen years later Laurel is facing another chance, or lack or it, for parole which is strongly objected to by the toddler's family. While Rosie, now Hazel, is celebrating her 25th birthday at a seaside hotel with her fella and his daughter when a five-year old girl goes missing from the hotel. It isn't long before someone sees similarities between Hazel and the child she was. So she decides to bring it all out in the open, tell what she remembered of that day 19 years earlier but swears that she knows nothing of the missing child in present day. I thought that the author did amazing creating the opening chapter. It is shocking and harrowing showing how devious and cunning the sisters were, especially Laurel to get the toddler to go with them but it isn't graphic. Later in the book some of the injuries are learnt and that really does hit hard but it is written with thought to who will be reading this book. I felt that I connected with the characters in the book like I was supposed to, as my feelings were constantly changing as the story progressed. I am a former human rights lawyer who used to work for the UK Government. As a litigator, I worked on cases involving Winnie Mandela and the rapper Snoop Dogg. I loved my job but then we re-located to the tropics and now I live in wonderful Singapore. I also write short stories which have been published in in various anthologies. And when I’m not writing, I’m running The Singapore Writers’ Group wh I am a former human rights lawyer who used to work for the UK Government. As a litigator, I worked on cases involving Winnie Mandela and the rapper Snoop Dogg. I loved my job but then we re-located to the tropics and now I live in wonderful Singapore.